At StoreMoreStore, we want to make storing things easy for you. Storing framed artwork collections, photos, sculptures, etc can be a challenge because nothing is the same size and everything needs to be protected. This is why we offer Adjustable Art Storage Shelves that will easily house your artwork collection while keeping it safe. Each horizontal shelf can be adjusted up or down on 1 ½ inch increments so that each opening can be customized to meet your art storage requirements. In addition, the Adjustable Art Storage Shelves have a powder coat paint finish that does not put off gases to ensure your collection will be protected long-term. 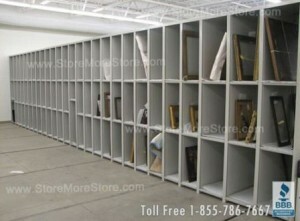 Best of all, the Art Storage Shelves come with a lifetime warranty, which means these shelves are really made to last. 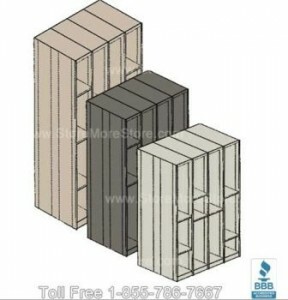 The standard Art Storage Shelves unit is 88 ¼ inches tall; however, any height from 48 to 121 inches is available. Each unit width is 12 inches across and depth options are 18, 24, 30, and 36 inches deep. In addition, there are 13 different colors to choose from for your Adjustable Art Storage Shelves to match any décor. 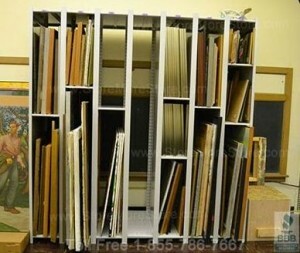 You can find these Adjustable Art Storage Shelves online at StoreMoreStore. As always, if you have any questions give us a call at our toll free number 1-855-786-7667 or send us a message.